One man’s budding interest in wine proved to pair well with his entrepreneurial spirit. When Jim Cash’s childhood friend, Sam Kindred — whose family had been in the grocery store business — decided to open a wine shop, he asked Cash to join in. “I told him I’d like to be a partner in a business, but I didn’t know a thing about wine,” says Cash, who turned out to be a quick study. Soon, however, Cash was beset by storage problems. 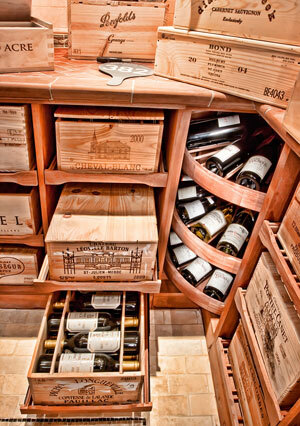 He became dissatisfied with the various wine storage systems on the market; in addition to having to pull out several bottles to locate the one he was looking for, labels became damaged, bottles were dropped, and there was no space to store larger containers. Cash imagined a rack with slide-out drawers, where different-sized bottles could be viewed at once; a rotating circular rack, to optimize corner storage space; and a unique bottle-cradling system that would improve airflow while better maintaining temperatures. After determining the product he was looking for didn’t exist, he worked with a custom millwork shop to develop his own. “We approached the design process with intense vigor, partly because I tend toward the obsessive, and partly because I was afraid I would discover some type of fatal flaw in the design,” says Cash, executive vice president of The Christman Co., a construction management and contracting firm in Lansing. When demand proved real, Cash went through what he calls the “logical steps,” which included a partnership with Benchmark Wood Studio in Holland, Mich. and its deep bench of some of the world’s best wood artisans and craftsmen. In the three years since launching Revel Custom Wine Cellars in Lansing, Cash and his team have produced 25 custom cellars for clients across the United States, Canada, and England. On the high end of the spectrum, Revel has created storage systems for as many as 5,000 bottles and tackled projects that brought in as much as $200,000. Clients include business magnate Sir Richard Branson, along with actors Brad Pitt and Angelina Jolie.